This sign is definitely a little unusual. Not the sign, so much, which declares "the South's warmest welcome." But a very small sign it nonetheless is, only about eight feet wide and three feet high. And it's a good ten yards off the pavement. 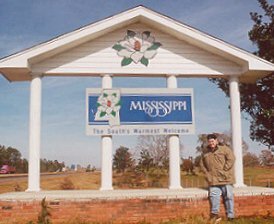 But, for a moment, compare and contrast the support structure for the welcome sign here in Mississippi with one in, oh, my home state. This is, I think I can safely say, the only welcome sign that I've yet encountered that had its own portico. A brick pedestal, four white columns, and a roof. I'm at somewhat of a disadvantage here. I visited 17 states on my Dallas road trip in 2000, including my home state of New Jersey. For some reason, and I don't know why, Alabama and Mississippi were the two least memorable states. And in the two and a half years (has it been that long already?) since I've been there, I never, until this week when I'm trying to finally get this site done, wrote the essays for Alabama and Mississippi. I kept a journal for the beginning of the trip, but lost track of it after Oklahoma City. Day 1 of the return trip brought me out of Dallas and down to Austin and Day 3 would take me to Tallahassee (remember, this was right at the climax of the Florida Recounts). I'd also be in Atlanta on Day 4, which I was very interested in seeing, and after Day 4 I'd be home. Day 2 just got lost in the shuffle somewhere. And all through the months since then I've always procrastinated when it came to Alabama and Mississippi. So I apologize if you were trying to find a lot out about the Mississippi State Capitol. 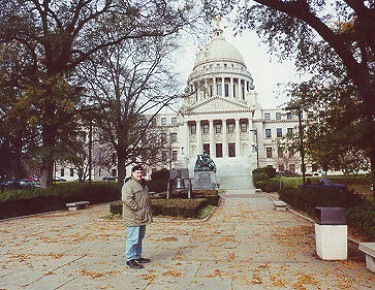 It's really too bad as well, since Mississippi has a rather nice capitol. The lawns on the grounds surround the building but pretty dense tree cover obscures the views from most angles. The only monument of note that I recall (read: took a picture of) was one that said, "United Confederate Veterans honor the memory of the Confederate women of Mississippi." This capitol, Mississippi's third, was built on the former grounds of the state penitentary in 1903. The construction costs were completely covered by the back taxes of the Illinois Central Railroad. The grounds contain one of the 53 Liberty Bell replicas; I didn't see it here, but I did see a Liberty Bell replica in Phoenix and another in Salem, Oregon. This page loaded in 2.263 milliseconds.